The mythology, legend and lore behind it. The fact that anything that is considered out of this world becomes acceptable, just for one day. I also have a sweet tooth and love trick or treating, though I haven’t been out in many years. I just buy my own treats now, though it doesn’t have the same thrill. I wanted to give you all a Halloween treat this year and I think there’s no better treat than a good book. 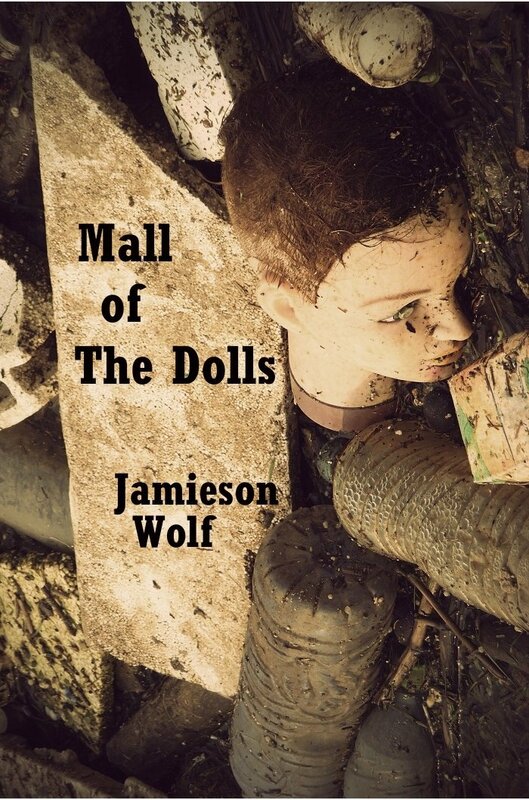 So, starting tomorrow and running until October 31st, you’ll be able to download my little novella, Mall of the Dolls, for free! Out shopping at the local mall one weekend afternoon, Owen and Val begin to see doll like girls wandering around the mall in the crowds. They are all wear the same curly wig, they all wear makeup and rhinestone ear rings. Val and Owen begin to grow alarmed as they realize how many of the dolls are in the shopping centre with them. When they become trapped inside of a crowd of doll children, neither of them have any idea what will happen next. The end of the world has finally come. The novella started with a bit of inspiration. My friend Val and I were out at a mall and saw a crowd of girls all dressed the same with long curly wigs, big ear rings, lots of makeup and shiny dresses. I asked one of the mothers what was going on. “It’s an Irish Dancing competition.” She said, as if that explained everything. That was all the inspiration I needed. I went home and wrote what I thought would be a short story. Then it kept going, as I wondered who else would be caught in the mall. I’m really happy with how it turned out and it ended up being the first thing I published under my Wolf Flow Press imprint. Added to that, it’s the perfect tale for Halloween. There’s some coarse language throughout, as you should expect when zombie children are posing a threat to groups of unsuspecting people, but it’s a well-told tale with excellent scenes and great setting. Wolf knows how to build a scene without over-describing it, pulling the reader right into the action (and making you think you’re about to get attacked by one of the shadow men as well…). Read with ALL the lights on. So from October 27th to the 31st, you can download Mall of the Dolls for FREE! It’s available for download to your Kindle, iPad, iPod Touch, PC or Android Device. If you read it, why not consider reviewing it? I truly hope you enjoy it and that it brings a little bit of fright to your Halloween!